I have been pretty much absent here but the glorious fall we have had here has kept me busy and at our camp a lot. 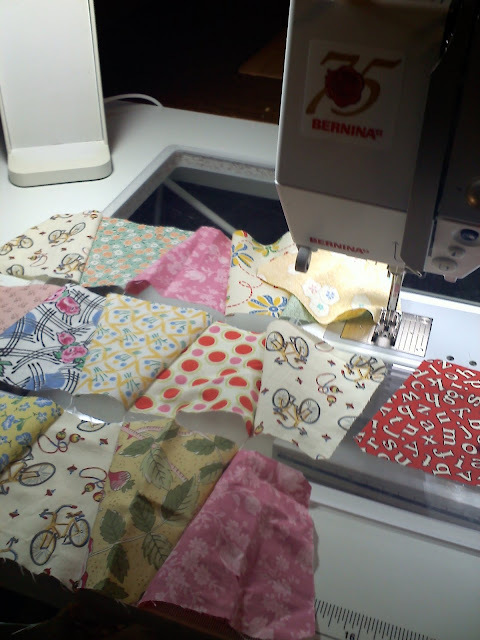 You know, I retired last June and I thought I would have more time for quilting but I am busier than ever. But on a rainy day here in NH I cut a baby tumbler quilt with my Go cutter and am happily sewing along on some bright fabrics. Hope you are having a bright and shiny day. The more I see this quilt being made, the more I think I want a go cutter!! Great way to spend a rainy day.Looking forward to seeing this go together. I love the scrappiness of this! So adorable! I retired in December, and nope .... no more time than when I was working! I cut tumblers with my red scraps (also using the GO - @Pen pen: YES! get one!). Love the scrappiness of yours. Looking forward to the completed top pics. I love the print with the bicycles on it - so cute. Wowzer you are a busy lady and that tumbler quilt will be gorgeous!! Retirement sure isn't sitting around is it, but at least your having fun doing what you want to do. Do you recomment a go cutter?? I keep wondering if I should invest or not. How's your health issue going?? I just had my 3 month check and more tumors, oy vey - cancer is a never ending process. But it will not beat me! !